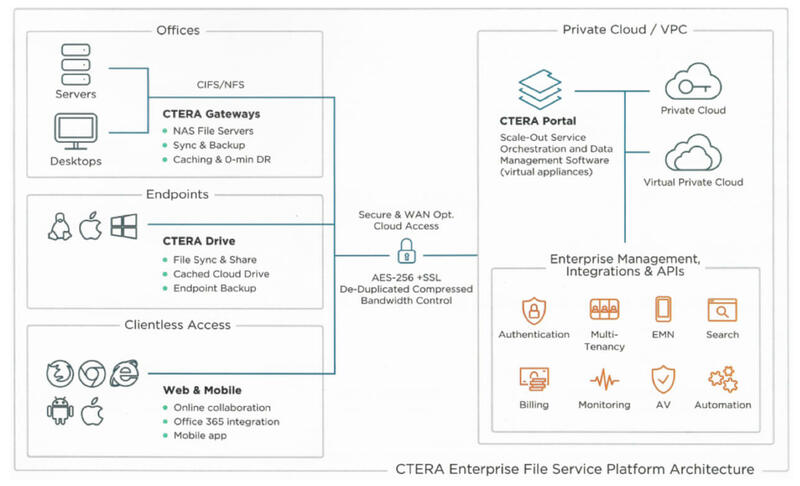 CTERA provide enterprises with the best experience in managing how files are stored, accessed, shared and governed in a world where data flows between clouds, and users work and collaborate on the go. Data silos and storage tied to a specific location or hardware are in the past. Designed for cloud service providers and IT-as-a-Service organizations, the platform features full service delivery automation tools and APIs for provisioning, chargeback and more. The CTERA Platform is deployable from any on-premises or public cloud (CTERA or customer-owned VPC) infrastructure to provide superior savings, flexibility and data security. Unlike public SaaS solutions, CTERA provides a solution that contains 100% of your data, service management, encryption and authentication in your network. From endpoints to remote offices to applications running in the cloud, the CTERA Platform uniquely provides comprehensive insight and control over organizational data from one central platform. With support for cost-effective cloud infrastructure, global deduplication, service automation and many use cases from one platform, CTERA saves organizations up to 80% on administration and capacity. The CTERA Platform integrates with modern service catalogs and provides a series of self-service productivity apps to enable IT organizations to transform into enterprise, on-demand app stores. CTERA Agents and mobile apps provide secure data protection and file sync and share services for remote servers, laptops and mobile devices – all managed from a single console. CTERA’s platform provides a secure and isolated multi-tenant environment. It allows organizations to share infrastructure while maintaining data confidentiality and delegating service management. CTERA employs source-based de-duplication and compression, minimizing impact on WAN bandwidth and reducing storage usage by up to 90%. You can de-duplicate blocks across multiple sites, geography, departments and users.